Glossary - Cornerstone Roofing, Inc.
As one of the premier roofing contractors in the Puget Sound area over the past two decades, we at Cornerstone Roofing have learned that a knowledgeable customer is a happy customer. Not only are they more understanding about the difficult aspects of the job, but they can better explain their roofing problem so we can fix that problem more quickly and efficiently. This is why we have a complete roofing glossary for our customer’s convenience. Each tab below contains an alphabetical list of roofing terms. Click on the tab of the letter you would like to view the terms in. If you have any questions on the roofing terms, your estimator will be happy to help. Architectural Shingles: Also known as laminated or dimensional shingles, architectural roofing shingles are among the highest quality roofing products made. Traditionally, they are composed of a heavy fiber glass mat base and ceramic-coated mineral granules that are tightly embedded in carefully refined, water-resistant asphalt. Architectural roofing shingles provide stunning three-dimensional appearance. Some of the most attractive architectural roofing shingles simulate cedar wood shakes. These shingles are quite thick with random slots similar to real shakes. Another unique architectural shingle design imitates the look of slate without the weight issues that normally accompany those materials. These architectural roofing shingles do not require any additional roof support as slate would. Back Surfacing: Granular material added to shingle’s back to assist in keeping separate during delivery and storage. Built-Up Roof Membrane (BUR): a continuous, semi-flexible multi-ply roof membrane, consisting of plies or layers of saturated felts, coated felts, fabrics, or mats between which alternate layers of bitumen are applied. Generally, built-up roof membranes are surfaced with mineral aggregate and bitumen, a liquid-applied coating, or a granule-surfaced cap sheet. Note: Cornerstone Roofing does not install Built-Up Roofing systems. Closed Cut Valley: A shingle valley installation method where one roof plane’s shingles completely cover the other’s. The top layer is cut to match the valley lines. Cupping: When shingles are improperly installed over an existing roof or are over-exposed, they may form a curl or cup. May also be due to a manufacturing defect. Dimensional Shingles: See Architectural Shingles. 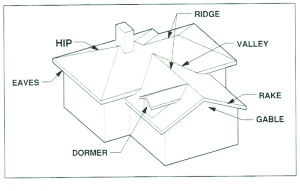 Dormer: A raised roof extending out of a larger roof plane (see figure below). Drip Edge: An installed lip that keeps shingles up off the deck at edges, extends shingles out over eaves and gutters, and prevents water “wicking” beneath shingles at roof edges. Eave: a projecting edge of a roof that extends beyond the supporting wall (see figure above). Exposure: The traverse dimension of a roofing element or component not overlapped by an adjacent element or component in a roof covering (see figure below). Eyebrow: See “Dormer”, usually of small size, whose roof line over the upright face is typically an arched curve, turning into a reverse curve to meet the horizontal at either end. Also, a small shed roof projecting from the gable end of the larger, main roof area. High Nailing: When shingles are nailed or fastened above the manufacturer’s specified location. Ice Dam: When a snow load melts on a roof and re-freezes at the eave areas. Ice dams force water to “back-up” under shingles and cause leakage. Laminated Shingles: see Architectural Shingles. Low Slopes: Roof pitches less than 4:12 are considered low sloped roofs. Special installation practices must be used on roofs sloped 2:12-4:12. Shingles cannot be installed at slopes less than 2/12. Metal Flashing: accessory components fabricated from sheet metal and used to weatherproof terminating roof covering edges. Frequently used as through-wall flashing, cap flashing (coping), counterflashing, step flashing, etc. Nail Guide Line: Painted line on laminated shingles, to aid in the proper placement of fasteners. Nail Pop: When a nail is not fully driven, it sits up off the roof deck. Overdriven: The term used for fasteners driven through roofing material with too much force, breaking the material. Overexposed: Installing shingle courses higher than their intended exposure. Primer: a material which is sometimes used in the process of seaming single-ply membranes to prepare the surfaces and increase the strength (in shear and peel) of the field splice. Ridge: highest point on the roof, represented by a horizontal line where two roof areas intersect, running the length of the area (see figure below). Valley: the internal angle formed by the intersection of two sloping roof planes (See figure below).